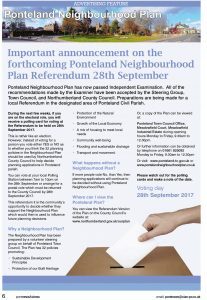 Following the successful referendum, the Ponteland Neighbourhood Plan was formally ‘made’ at a meeting of Northumberland County Council’s Cabinet on 23 November 2017. A Decision Statement confirming that the Plan has been made and brought into legal force has now been published. Now that the Neighbourhood Plan is formally ‘made’, it becomes part of the statutory development plan. 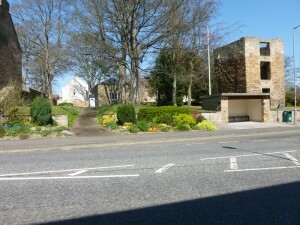 Consequently, decisions on whether or not to grant planning permission in the Ponteland neighbourhood area will need to be made in accordance with the plan, unless material considerations indicate otherwise. The electorate has voted for the Neighbourhood Plan containing 32 planning policies which will help Northumberland County Council decide planning applications in this neighbourhood area of Ponteland Civil Parish. Ponteland Neighbourhood Plan has now passed Independent Examination. All of the recommendations made by the Examiner have been accepted by the Steering Group, Town Council, and Northumberland County Council. Preparations are now being made for a local Referendum. During the next few weeks, if you are on the electoral role, you will receive a polling card for voting at the Referendum which will be held on 28th Sept 2017. This is rather like an election. However, instead of voting for a person you vote either YES or NO as to whether you think the 32 planning policies in the Neighbourhood Plan should be used by Northumberland County Council to help decide planning applications in Ponteland parish. 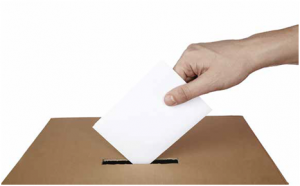 You can vote at your local Polling Station between 7am to 10pm on the 28th September or arrange for a postal vote which must be returned to the County Council by 28th September 2017. This referendum it is the community’s opportunity to decide whether they support the Neighbourhood Plan which would then be used to influence future planning decisions. What happens without a Neighbourhood Plan? If more people vote No, than Yes, then planning applications will continue to be decided without using Ponteland Neighbourhood Plan. 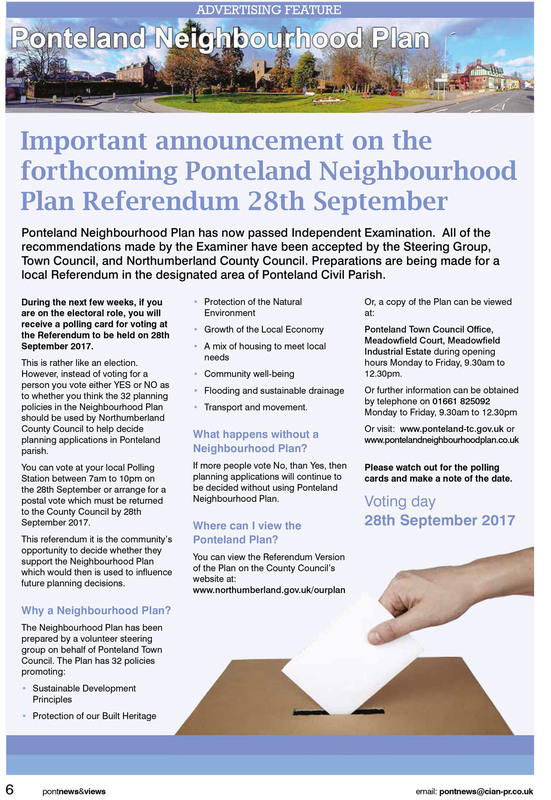 Where can I view the Ponteland Plan? and make a note of the date. Following the end of the consultation period, after December 16th 2016, we have reviewed the responses received and identified changes needed to be made to the draft Plan and its evidence base. Neighbourhood Plan ‘made’ by NCC –expected Autumn 2017.